You may think of Soundtrack Pro as geared mainly at Final Cut Pro users (and if you are one, don’t miss Anton Linecker’s review of FCP 5 for Macworld today). 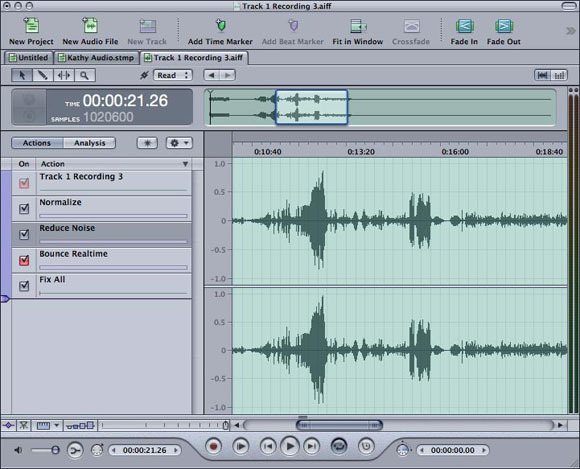 But I’ve found it useful in music editing, too; I’d been looking for a more flexible, elegant audio editor for music use. Lacking multitrack recording and MIDI capability, among other features, Soundtrack Pro is certainly no substitute for other audio software. But I find it has replaced BIAS Peak for my day-to-day editing tasks. Logic Pro, DP, Ableton Live, and many other apps let you change the default audio editor to an external program. That position now falls to Soundtrack Pro on my system. Ironically some of the features other users are complaining about — that it’s not as deep as Logic or Pro Tools — are part of the reason why I find it ideal as an audio editor, complementing those other programs. And while I’ve long been a fan of Sound Forge on my PC, this app really gives it a run for its money thanks to action layers, automation, and scripting. I should say, I expect the positive review to be controversial, as there’s been some heated discussion of Soundtrack Pro on Apple’s boards. Some love it, some hate it, others have changes they’d like to see. What I do notice is many of these issues have to do with exchanging files with FCP, which has been improved (though I think Apple should provide additional flexibility on the FCP end of things, and better explain to users how the functionality works in the documentation). If you have thoughts, of course, no reason to be shy: jump in here, or on Macworld.com.